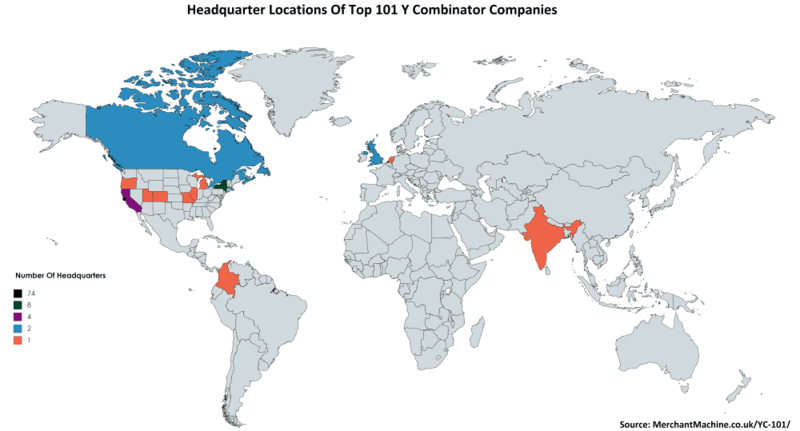 The map above shows the headquarter locations of the top 101 Y Combinator Companies by valuation as of October 2018. Note Strikingly is headquartered in Shanghai China and not Sunnyvale as originally published. The San Francisco Bay Area is home to the vast majority of companies (74 73 out of 101) with 63 located in San Francisco itself. All of the top 10 companies are located in the Bay area with 9 of the 10 headquartered in San Francisco. New York City is the second most popular headquarter location with 8 companies. Ginkgo Bioworks is the most valuable company located outside of the Bay area and Rappi is the most valuable company located outside the US. 94 93 of the top 101 companies are based in the US. The only other countries with top companies were Canada (2), the UK (2), Colombia, India, the Netherlands and China. Thank you for visualizing the data. One correction: Strikingly’s headquarter is in Shanghai, China. Oh thanks for the info, will note it on the page.